The ScoreItNow!™ Online Writing Practice service is a web-based tool that can help you sharpen your analytical writing skills and prepare for the Analytical Writing section of the GRE® revised General Test. Using ETS’s patented e-rater® technology, the automated scoring system provides immediate essay scoring in a confidential, risk-free environment. Respond to GRE Analytical Writing topics created and tested by ETS test authors. Submit your responses online and get immediate scores on your responses from ETS's e-rater automated scoring system. Review scored sample essay responses on the topics you select. Review general suggestions for improving your writing skills. Receive diagnostic feedback on your responses. Plus, six new bonus topics are now available: After you have submitted two essay responses for scoring, you will have the additional option to write and submit essay responses on six FREE bonus topics (three for the Analyze an Issue task and three for the Analyze an Argument task) for more practice. You will receive a score on each essay response that you submit on these bonus topics. The service contains two options from which you can select: the Practice Option and the Test Experience Option. Purchase two GRE Analytical Writing topics in any combination (i.e., one Analyze an Issue topic and one Analyze an Argument topic, or two topics of the same task type). Write responses online or offline. The tasks are timed in the online option. You choose the topics on which you will write. At any time, you can save your work and exit the ScoreItNow! system, and come back later to complete your essay response. Receive a score for each essay response submitted and additional feedback. Purchase one Analyze an Issue topic and one Analyze an Argument topic (simulates the GRE Analytical Writing section). The test will deliver one Issue topic; the Issue topic will be timed (30 minutes). The test will deliver one Argument topic; the Argument topic will be timed (30 minutes). The test will select the topics on which you will write. Write responses online using the same word processing features as the GRE revised General Test. Receive a score for each response submitted, a total GRE Analytical Writing score and additional feedback. After you have submitted your essay response(s) for scoring, you will receive feedback that will help to improve your writing. Scoring guide text for each of the scores you receive. A score level description for the Analytical Writing Total score you receive (Test Experience only). Scored sample essay responses with reader commentary for each of the two topics on which you submitted responses. You may purchase additional topics with scored sample essay responses and reader commentary in multiples of two and submit responses anytime within six months from the date of purchase. Select the Practice Option if you want to select topics and have the option of composing your response online or offline. If you compose offline, you will need to copy and paste your response into the ScoreItNow! Online Writing Practice text box before submitting for scoring. You can elect to purchase any combination of the two task types — i.e., one each or two alike. You will not be constrained by the time allotment for the Analytical Writing section of the GRE revised General Test. Remember that your response will be scored based on standards associated with a response written in the actual time allotted for the Analyze an Issue and Analyze an Argument tasks in the GRE revised General Test. Select the Test Experience Option if you want to have an experience similar to the one you will have in an actual GRE revised General Test. Remember, with this option you must compose your responses online and within the time allotted in the actual test. NOTE: Although performance on ScoreItNow! essay topics is not an exact predictor of how individuals might perform on the GRE Analytical Writing measure during an actual GRE revised General Test administration, users are encouraged to write the ScoreItNow! essay responses under timed conditions to get a better sense of how they might perform on the actual test. 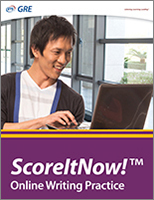 ScoreItNow!™ Online Writing Practice version 2.5 has been verified to be compatible with the following browsers on Windows® and Macintosh® devices. The list above is based on the current stable versions available for quality review prior to product launch. Newer versions of these browsers may be compatible but have not undergone a quality review with this product.